Leading hotels across the Middle East a launching a series of Ramadan tents today as Muslims across the region begin celebrations in honour of the holy month. Here Breaking Travel News takes a tour of offerings from Emirates Palace in Abu Dhabi, Rosewood Corniche in Saudi Arabia, Jumeirah Zabeel Saray in Dubai, and many other top attractions. 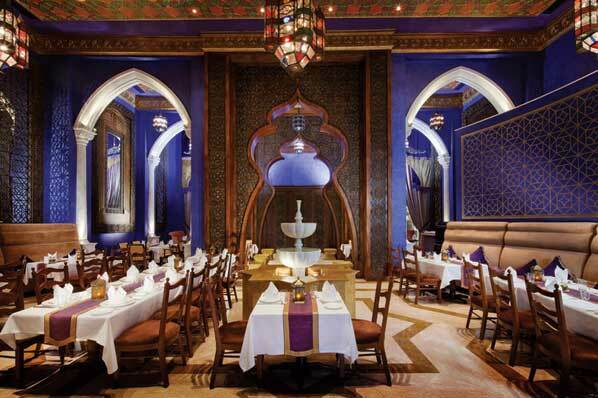 A palatial Ramadan pavilion has opened at Emirates Palace in Abu Dhabi. The custom built pavilion sits on a site of hundreds of square metres, overlooking the beach on one side and stunning façade of the hotel on the other, and incorporates the existing 12- metre-high palm trees and grand fountain of the palace terrace. Emirates Palace, the icon of Emirati hospitality in the UAE, has partnered with the National Bank of Abu Dhabi and Wahat Al Zawiya to create a special Ramadan experience for residents and guests in what is the largest purpose built Ramadan structure in Abu Dhabi. Alexander Schneider, Emirates Palace hotel manager said: “After providing a limited Ramadan experience in 2012, Emirates Palace decided this year to create an out-of-this-world venue for residents and guests that truly reflects the legendary Emirati hospitality. The elegant design of the Ramadan pavilion incorporates the signature gold and traditional Mashribiya details of Emirates Palace in a light and airy space. Comfortable seating spread throughout the pavilion creates cosy enclaves to enjoy time with friends and family throughout the Holy Month of Ramadan. The pavilion can host up to 1,200 guests per day and includes four private majlises, a large open dining area for Iftar buffets featuring signature dishes from Mezlai, Emirates Palace’s famous Emirati restaurant, as well as a separate lounge area. A custom-built climate control system keeps guests comfortable around-the-clock, as the pavilion will be open both day and night. Emirates Palace executive chef, Sandro Gamba, promises the highest quality of food will be available throughout the month. Gamba is working with local farms and suppliers to procure local produce and other ingredient to ensure fresh and tasty food, and to enhance the authenticity of the festive menus. This year Emirates Palace expects the number of visitors to exceed that of previous years. The increase in visitors to Abu Dhabi is expected to continue throughout summer and the Ramadan Pavilion at Emirates Palace will provide a memorable Ramadan experience, as they welcome residents, visitors, guests and corporate groups from around the region. Per person rates in the Ramadan Pavilion are AED249 for Iftar and Suhour will be à la carte, excluding 16 per cent tax and tourism fees. More information on the Emirates Palace website. The property was also recently recognised as offering the World’s Leading Hotel Suite by the prestigious World Travel Awards. Saudi Arabia’s leading hotel, Rosewood Corniche has also lifted the lid on what its guests will be able to experience this Ramadan, with the hotel offering its best Iftar and Sohour buffets yet. The luxurious hotel will be transformed into a traditional Layali Hijazia setting, providing guests with a truly memorable and special Ramadan experience as they are transported into a world full of charm and opulence. The hotel’s popular restaurants, Habsburg and Noodles, will open at sunset to serve delicious Iftar buffets featuring classic Hijazi delicacies such as gursan, jeraish, mento, lamb kabsa, and yaghmosh along with traditional Ramadan delights in a unique setting underlining Hijazi heritage and culture. Later in the evening, the hotel will come to life again as diners indulge in the Sohour buffet to celebrate the spirit of Ramadan in Habsburg. Guests can choose from an extensive range of international and Arabic food, freshly prepared at live cooking stations, including saj and shawarma, lamb and beef liver, egg omelettes and foul madamas. Both venues will be beautifully decorated with artefacts of Hijaz, such as the Fanous lanterns, Mashrabiya windows and traditional handicrafts, to re-create the quintessential charm that will transport guests to the quaint realms of the ancient city of Hijaz. “After last year’s overwhelming success and the feedback from our guests, we are delighted to build upon the Hijazi theme throughout the hotel at this special time of year,” said Hans-Peter Leitzke, managing director, Rosewood Corniche. Rosewood Corniche – considered Saudi Arabia’s Leading Hotel by the World Travel Awards - has partnered with the niche luxury renowned fragrance house Amouage, which will line up to display their latest fragrances throughout The Holy Month. Habsburg and Noodles restaurants are also available exclusively for group gatherings; guests can contact Rosewood Corniche restaurant reservations to discuss group bookings for large family gatherings up to 200 guests, work team events and celebrations. Additionally, guests can enjoy Iftar and Sohour in the privacy of their room or suite with a special set menu comprising traditional Arabic mezzehs and succulent grills. Situated on Jeddah’s Corniche, Rosewood Corniche is ideal for both business and leisure travellers. The celebrated Jeddah Corniche runs parallel to the Red Sea for over 32 kilometres and provides convenient access to the city’s business and leisure areas. As the premier hotel in Jeddah, the stunning Rosewood Corniche redefines modern elegance and offers unparalleled personal service and world-class amenities, including 24-hour butler service for each of the 127 guest rooms and suites. The Iftar buffet offers two options at SAR275 and SAR295 per person and the Sohour option is SAR255 per person, inclusive of Ramadan juices, Evian natural mineral water and traditional Arabic coffee. This month, and throughout the Holy month of Ramadan, Jumeirah Dhevanafushi and Jumeirah Vittaveli will be inviting guests to mark the month with an exclusive stay in the Maldives. Those looking to observe the occasion with family or friends in idyllic surroundings can take advantage of a range of additional services and enjoy specially arranged Iftar evening meals to break each day’s fast. Jumeirah Dhevanafushi, situated in a privileged and secluded location at the southernmost tip of the Maldives, is an ideal location for reflection during Ramadan. Guests will be treated to complimentary dates and Arabic sweets to enjoy between dusk and dawn, and Ramadan juices – including flavours such as date, apricot, rose and kamardine - will also be available upon request. For the Iftar meal, fine-dining restaurant Johara will feature an Arabic area, while a family-style dinner menu will run at beachside restaurant Azara. An Arabic style Suhoor menu is available from in-villa dining at any time of day for those who wish to dine early in the morning before the fast begins again at sunrise. Guests can also mark the end of each day’s fast with a trip to Khibar to enjoy a sunset selection of shisha prepared by the barman, as well as fresh juices and dates. And to celebrate Eid, a special Arabic Buffet will be held on Saturday August 10th. Guests wishing to celebrate Ramadan a little closer to Malé can choose Jumeirah Vittaveli, a stunning resort just a 20-minute boat ride from Malé International Airport. Guests can break each day’s fast in-room with complimentary Ramadan essentials such as dates, buttermilk & watermelon juice. Then continue the evening at BAR-EE as dates, Arabic sweets, fresh juices, Turkish coffee and shisha are served to accompany the sunset. Those staying on half or full board can choose to dine on a specially created Iftar menu served in Samsara from 19:00 to 22:30, or indulge with in-villa dining between 18:00 and 23:00. And, instead of a traditional breakfast, guests can opt for a Suhoor menu served in-villa between 00:00 and 06:00 before the fast begins again. To mark the end of Ramadan, guests will also be treated to two nights of celebrations. On August 7th, an ‘Arabian Night’ will take place at Samsara with a live four piece band, local belly dancers and a fire dancer. Half and full board guests can also enjoy a complimentary Arabian style buffet. Then, on August 8th, an ‘Arabian Tribal Night’ will take place at signature restaurant Mu with traditional Arabian food and plenty of entertainment. The Ramadan room and dining services are available from July 9th until August 7th at both Jumeirah Dhevanafushi and Jumeirah Vittaveli. Head over to the Jumeirah website for more information. 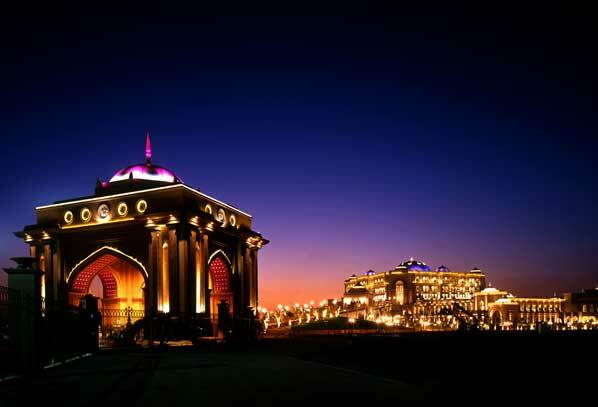 Jumeirah Zabeel Saray, the Ottoman inspired luxury resort located on Palm Jumeirah, has also recently announced details of its Ramadan offerings throughout the Holy Month. Beautiful interiors and impeccable service are combined with a unique blend of culinary options, special hotel packages and cultural spa treatments to make Jumeirah Zabeel Saray a special place to enjoy Ramadan with friends and family. Imperium: This sumptuous Iftar buffet offers a lavish selection of Arabic favourites and international delicacies amid the palatial backdrop of Imperium restaurant. AED195 per person - price inclusive of Arabic juices and soft drinks. Al Nafoorah: A mouth-watering selection of Lebanese mezzeh and grilled fish and meats are served as a set-menu family-style meal at the award-winning Middle Eastern restaurant, Al Nafoorah. AED170 per person - price inclusive of Arabic juices and soft drinks. Lalezar: Hearty selections of traditional Anatolian delights are served as a set-menu in this signature Turkish restaurant. AED170 per person - price inclusive of Arabic juices and soft drinks. Sultan’s Lounge: The popular lobby area turns into a traditional Arabic lounge with a variety of Suhour options and shisha on the terrace. Prices vary. Talise Ottoman Spa, one of the largest and most luxurious in the Middle East, offers a true cultural experience with Selection of Arabia - a spa combination package that offers a choice of two Middle Eastern inspired experiences. The Ottoman Spa is considered the Middle East’s Leading Spa by the World Travel Awards. Starting with a Sultans Massage, the package is completed with the choice of either a Radiant Date Facial or Desert Sand Body Scrub for a reduced price of AED885 (and before August 30th 2013, guests receive AED100 worth of vouchers towards their next treatment). For unique gift ideas, Talise Boutique offers a selection of luxury spa products to help recreate the Talise Ottoman Spa experience at home. Throughout the summer, UAE residents can avail a special spa, restaurant and stay package. Starting from AED1,499, the package includes complimentary breakfast or Suhour; late check-out; either lunch, dinner or Iftar; a Traditional Turkish Hammam experience for two; access to Wild Wadi Waterpark and more. Take a look at the Jumeirah Zabeel Saray website for more information. 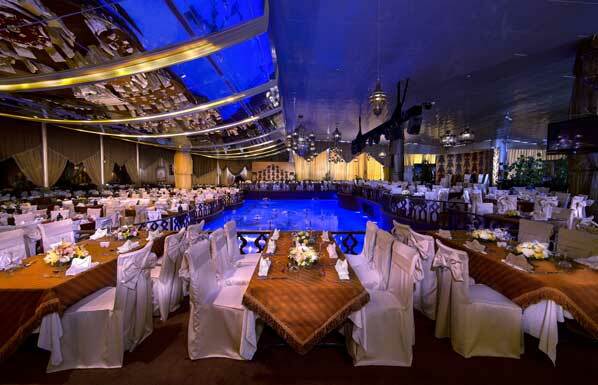 A traditional Ramadan experience is made more memorable at the Ramadan Tent at Al Mirqab ballroom, Four Seasons Hotel Doha, where families and friends can break their fast together at Iftar or gather for Suhour into the early hours. An extensive Ramadan buffet will feature exceptional international, local and traditional dishes as well as freshly baked breads, grilled meats and live cooking stations. The delicate strains of oud will add to the evening enjoyment. Seasons Tea Lounge opens at sunset and welcomes guests nightly after Iftar to linger over a cup of aromatic tea or freshly brewed coffee. Throughout the month of Ramadan, Seasons Tea Lounge offers an extensive menu of light meals upgraded with a range of special oriental sweets and Ramadan drinks such as Amar Al Din, Tamer Hindi and Jellab. The Pool Grill restaurant will serve refreshing Ramadan drinks, an inspired poolside light-fare menu and shisha. Or how about celebrating Ramadan with La Cigale, where every night offers an opportunity for an unforgettable Iftar and Souhour surrounded by those you care for. On the occasion of Ramadan, La Cigale Hotel with its exclusive partner QNB, sponsors Doha Insurance and Audi and time keeper Mouawad, proudly continues one of Doha’s fine traditions: La Cigale Ramadan Tent. 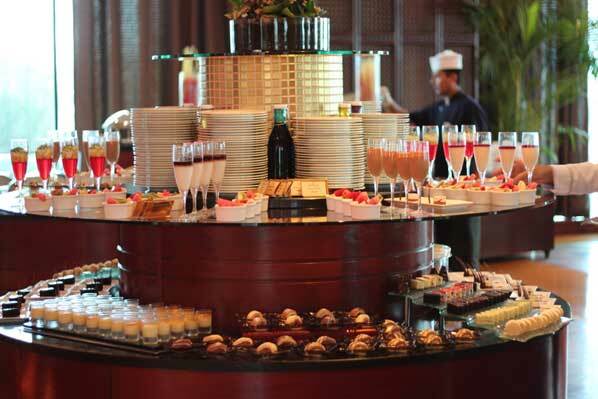 The extravagant Souhour buffet featuring Arabic and International dishes as well as succulent sweets and refreshing drinks, is a crowd attraction uniting citizens, residents and visitors. It is superbly around the spangled indoor swimming pool and amid live traditional Arabic entertainment that guests will take their seats in a special space or a private lounge and enjoy the fascinating taste of flavoursome shishas. This year and like every year, La Cigale Traiteur is the perfect choice to show your love and appreciation by sharing the signature homemade delicacies and fabulous gift baskets. La Cigale thought about hosts wishing to arrange for a lavish Iftar at the comfort of their homes, just choose your preferences from different options of buffet menus and La Cigale dedicated catering team will set everything for you. As for corporate invitations, groups of different sizes are welcomed to enjoy the intimacy of our private luxurious venues. 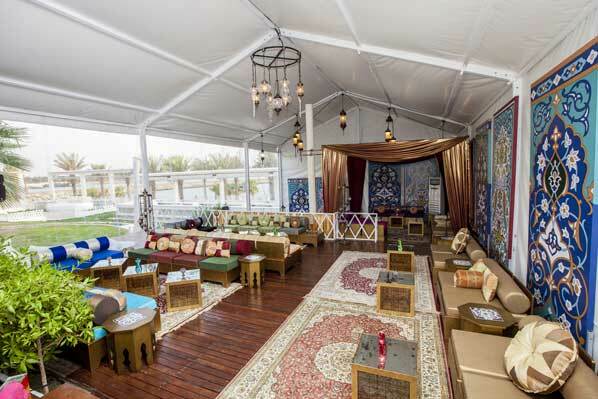 During the month of Ramadan, Rixos, The Palm, Dubai, will be showcasing Qasr Al Sultan, a designer tent that reflects back to the Sultan’s Palace where people used to break their fasts, play games, smoke shisha and experience traditional Arabic entertainment with a touch of Ottoman and Turkish flamboyance. The theme and setting of Qasr Al Sultan is inspired by the Ottoman Empire and it is the perfect gathering spot with family, friends and colleagues. Ramadan Iftar Buffet is influenced by the authentic tastes of Ottoman and Turkish cuisines, as well as the Arabic cuisines. 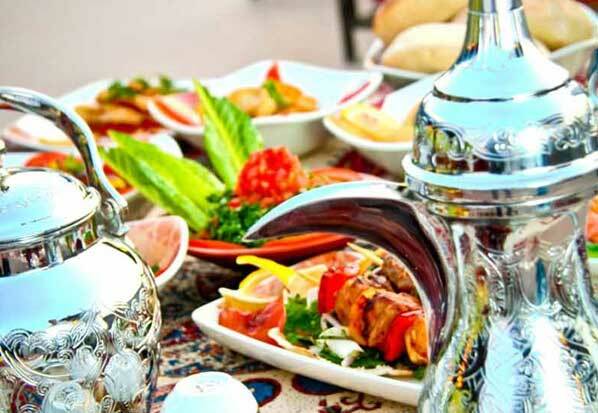 The Suhoor is a must that not be missed, consisting of marvellous Turkish and Arabic specialities such as mouth-watering mezzes, pide, saj, doner, shawarma along with the traditional Ramadan drinks from the Ottoman Empire and the Orient. More information on the official Rixos website.